2.5 L I4, CX-5 Touring, SUV, 6-Speed Auto w/OD, AWD. Financing options available to qualified buyers. While every reasonable effort is made to ensure the accuracy of these data, we are not responsible for any errors or omissions contained on these pages. Please verify any information in question with a dealership sales representative. Prompt and very courteous service. What was going to be done and cost was explained in full before any work was started. Was made aware of the status of work being done throughout the whole process. Very satisfied. Fast, efficient and friendly. My service recalls were done before promised time. Very nice experience for a first-timer. Holiday Mazda is definitely worth the trip. Buck in service always takes good care of me. The entire staff is some of the best around. I am a loyal fan! 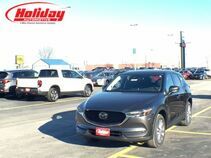 I had a wonderful experience with Holiday Mazda, I would highly recommend to go see them if you are looking for a vehicle, Kyle was very knowledgeable, helpful and went above and beyond to make the process fun. A few days after I bought my car I had a minor problem, when I took it back to see if they could help me with it Dean also went above and beyond to make sure the problem was taken care of. The next time I’m in the market for a vehicle I will definitely go back to Holiday!! Thank y’all for all your energetic and knowledgeable help, I love my Mazda!!! I drove to Holiday from Oconomowoc to look at a certain car they had available. I worked with Tyler and Ruth, both wonderful! Knowledgeable, kind and helped me leave with the car I wanted. They both made the experience painless and enjoyable. I highly recommend Holiday. Visited Holiday Mazda for service to have a used car inspected prior to purchase, and it was fantastic! Special thank you to service writer Danny, and mechanic Jack for providing very professional, honest, and friendly experience! Speak to Jim Krug! Very respectful, knowledgeable, non pushy personality! I’d highly recommend Jim seems to look out for what your needs are and looks to help you find that exact match! I was with my sister-in-law when she was buying her car. She worked with Jim Krug, and after going through this process with her, I told Jim I might have to come back from Washington state to buy a car from him! It was very straightforward, if there were any issues with a car he told us, and she ended up buying a car today. I am extremely impressed with the way Holiday Mazda treated my sister-in-law and I think Jim was the best salesman I've ever seen. Just a really good guy! They went the extra mile to help my SIL! Outstanding dealership. They listen to the customer, are professional, and fair. Just completed our fourth purchase with John Krug/Holiday Mazda and will return. It is certainly "worth the trip" as Holiday treats folks right. Thank you. I leased a CX-3 from John Krug in 2016, the lease was coming to the end and had 6 months left. I researched whether we could trade in early and found a gap with the payoff and the wholesale on KBB, I contacted John to see if the dealer buyout was lower and he said yes, recommended coming in to run the numbers. John was sending me e-mail's on his day off. That we did, when we arrived John was on a errand so Alex Marchall assisted us before John returned, allowing us to test drive several vehicles. When John returned he took over and we settled on a Mazda6, a car we didn't intend to purchase. (by the way, love this car) Holiday purchased the CX-3 with no money out of our pockets and gave us a great deal on the new car. The team is awesome, it's great to see how they help each other out and never give you any pressure, they goal is to give you the beat deal and excellent service. We are a lifetime Holiday customers! Thank you John Krug for a great car buying experience! My husband truly valued your expertise and I just love the great car you found for us. You and Holiday Mazda really are well worth the trip to Fondie! Amazing service, friendly staff, great prices, quality all around, would recommend to everyone. Kourt was amazing! she was so helpful throughout the entire process! Thank you!! Jim Krug made our car buying experience pain less and fun! Very warm and friendly, plus answered all our questions. Great new showroom , and facility. My daughter was looking for a used car around $10k. Couldn't find one that she was OK with. But found a Mazda Certified Used Mazda 6 w/less than 36k miles. Initially dealt w/Tony Deich at Budget Ctr., he was speedy and courteous in replies. Referred to Tom Kuitert for the Mazda 6. Straightforward, no pressure. Got a car that was $1000 below KBB with a good warranty. May 2017, wife & I looked at used Lexus RX300. That didn't pan out, but found a Mazda Certified CX-5 with less than 4k miles. Again experience was very good. No hassle, answered all questions. It's 40 miles from my house, but its worth the trip!! This is now the third car (second Mazda) that we've purchased from Holiday and the experience has always been enjoyable. Their selection is vast and their location is better than most. We dealt with Sam Voss, who was friendly, helpful, thorough, and professional. We'll be back in the market for another Mazda in the next three to five years and we'll be heading back to Holiday at that time. As a side note, I bought my current Mazda 6 from Holiday (Tom Kuitert), who was also a pleasure to deal with and he went out of his way to make it a great experience for me and my youngest son. While I was signing paperwork, Tom took my son for a ride in a shiny new yellow Camaro. I recently purchased a vehicle from Holiday Mazda and was very satisfied with my experience. The decision to do business with Holiday was based on the good trade-in value for my vehicle. Other dealerships attempted to under value my vehicle. Holiday was the only dealership willing to negotiate the trade-in value of my vehicle. Their willingness to be fair was what sold me on doing business with them. My sales representative, Sam Voss, was friendly and knowledgeable. Sam’s willingness to treat me and my wife like people instead of a sale made the experience that much better. We got to know Sam very well during our time at Holiday. The entire staff worked exceptionally hard to earn our business and I appreciate the effort. Thank you again! I purchased a certified Mazda from Tyler Sommerfeldt. This was a long distance purchase. I live in Illinois. Tyler sent numerous pictures of the car and answered all my question. After I confirmed I wanted the car, Holiday Mazda sent a porter to pick me up. Yes the porter from Holiday drove 180 miles to my house. When I arrived at the dealership , I met Tyler which had the car ready and waiting. I also met Zach Rashid of service. Zach was very knowledgable and took extra time to answerer questions I had about new tires, oil, and alignment specs. I drove the car home, it performed flawlessly. Ten days after the sale, I contacted Tyler about a concern. He was professional and put me in contact with Nick Faymoville. Nick addressed my concern without hesitation. I also worked with Brandon in parts...he also was fabulous. Thank you Holiday Mazda and all you guys that I worked with. I purchased a certified Mazda from Tyler Sommerfeldt. This was a long distance purchase. I live in Illinois. Tyler sent numerous pictures of the car and answered all my question. After I confirmed I wanted the car, Holiday Mazda sent a porter to pick me up. Yes the porter from Holiday drove 180 miles to my house. When I arrived at the dealership , I met Tyler who had the car ready and waiting. I also met Zach Rashid of service. Zach was very knowledgeable and took extra time to answer questions I had about new tires, oil, and alignment specs. I drove the car home, it performed flawlessly. Ten days after the sale, I contacted Tyler about a concern. He was professional and put me in contact with Nick Faymoville. Nick addressed my concern without hesitation. I also worked with Brandon in parts...he also was fabulous. Thank you Holiday Mazda and all you guys that I worked with.